Our church, the Evangelical Christian Fellowship (ECF), outside Monrovia, Liberia, had a sending off ceremony on 26 June 2016 for a missionary family who will be serving in rural Liberia. We are sending Dexter Brown to the southeastern region, where he will be engaged in evangelism and church planting. 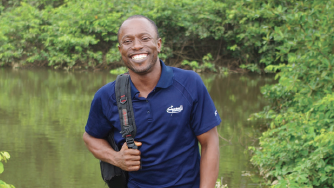 Based in the village of Saryah in River Cess, Dexter plans to extend his outreach to villages in Sinoe County and other remote places in the area. His wife, Cecelia, and their five children will join him some time next year. step out beyond the boundaries of our immediate church environment to share the gospel. ECF has been assisting the Browns in raising financial support. But motivating our members to appreciate and fully participate in mission has meant taking some intentional and concrete steps. It has been my prayer since the church was established that mission would be central to the motives and ministry of ECF. In our prayer meetings we have often asked the Lord to help us to be missions-minded. We see what is unfolding at the church as God’s answer. Every year we devote the month of May to mission: it’s the focus of our preaching, teaching, worship songs and prayers. We highlight the mandate, priority, beauty and reward of mission, so that our members will be encouraged to get involved. We raise a special offering each week of the month, which is usually sent to the mission board of the Evangelical Church of Liberia (ECOL) to support its ministry activities. In 2009 I started a one-year Bible training programme to equip leaders and potential leaders for effective service in discipleship and mission. Nearly all of those trained are now faithfully serving in the church. After Dexter Brown successfully completed the 2010-2011 programme, he served as a deacon and an adult Sunday school teacher. For several years before this my wife and I led weekend rural outreach trips. We usually encouraged church members to accompany us, so it was a vision trip for them. Some joined us in sharing Christ with the villagers. When they returned home, they told other church members about the excitement of the work, as well as the needs. This ministry resulted in the establishment of three churches in three villages. Dexter often accompanied us on these trips, and I watched him grow in his passion for souls as he shared his faith in Christ. His decision to go to the mission field was no accident; the Lord had been preparing him. Located just outside the capital city of Monrovia, ECF was established in 2001, when war was waging in Liberia. Today our membership is 165, and we have four Ebola survivors, including two orphans. Many church families, including the Browns, were placed under quarantine during the Ebola outbreak. Dexter had felt called to mission since 2012, when he completed his Bible training, but he wasn’t sure when or how to go. He and his family had been praying for God’s direction, so the call from ECOL was both a confirmation and an answer. As pastor of ECF, I praise God as He continues to transform our church into a body of “goers” and “supporters”! It brings all of us tremendous joy to see our members step forward for missionary service. It’s something every church should celebrate.